This Bokhara Collection is an original and authentic range of rugs featuring the world famous Bokhara design. This collection is a genuine Bokhara range and is not an imitation. The rugs are hand-knotted in Pakistan from pure new wool, which is antique washed over and over to produce an almost silk like feel. 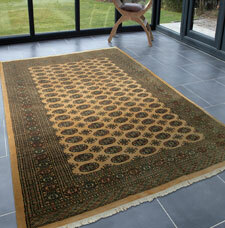 The rugs also feature antique fringes, which is a necessary trait of original Bokhara rugs. Please note that due to the nature of the Original Bokhara rugs, the number of rows of ellipses differs from one rug to another. Smaller rugs tend to have 2 or 3 rows, while the larger sizes have 3 or more. Images shown are for illustration purposes only.